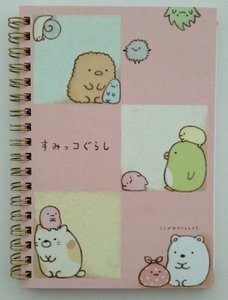 Adorable Sumikkogurashi ringbinder notebook from San-X, Japan. There are a total of 60 colourful ruled pages with lovely illustrations on them. This notebook is perfect for penpalling/ letter writing but could also be used as a diary, journal or for school. Just released by San-X, Sumikkogurashi is a new character and touches upon how shy Japanese people can be. It's a little negative and points out that Japanese people like to hide in corners since they are usually extremely shy. Sitting in the corner of a cafe or on the train makes them feel relaxed. So all of our new character friends all have some issue in their personality which makes them like hiding in the corner.